Cover photo: Village Enterprise students graduate out of poverty by completing their small-business training program. Editor’s note: How do you know if your impact investments are actually having impact? One way is how our newest partner, Village Enterprise Fund, has launched the world’s first development-impact bond that measures poor families’ income and net assets, and household consumption and savings, prior to and during a three-year program period. If Village Enterprise hits their targets in improving prosperity for poor families starting businesses, then funders with deep pockets such as USAID will reward them, enabling Village Enterprise to re-pay small lenders such as us–with interest–while still making a profit that will allow them to expand into new geographies. We at Skees Family Foundation feel deeply compelled to take risks with both grants and impact investments. Our budget is way too small to make a difference with large nonprofits, so we’ve learned to invert that weakness into a strength by being a first-in funder with our Seed Grants into nascent social enterprises. We’re proud to introduce you to one of our new social-impact investments (which we joined in their first-round of funding) that is the world’s first global impact bond. Take a quick tour with us to East Africa to see how their first year is going . . .
A small seed grant, rather than a loan, gives business owners an immediate kick-start in improving their family’s standard of living. Whether coming out of donors’ accounts or going into the pockets of working women like these entrepreneurs, every dollar matters. That’s why we try to choose our investments with a balance of compassion and precision. 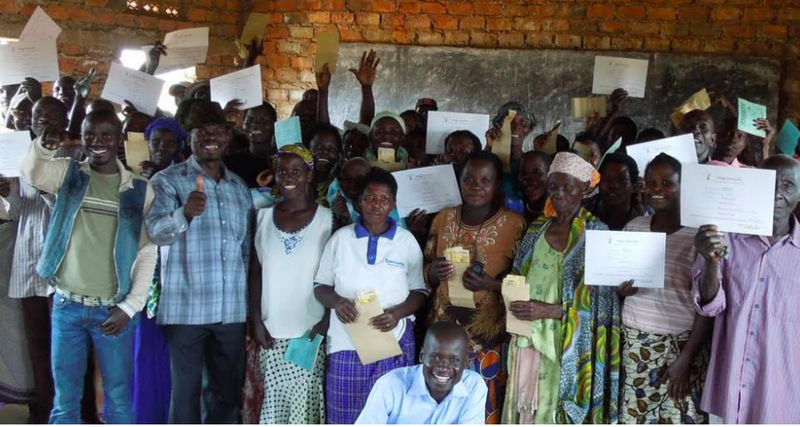 Village Enterprise DIB, the first-ever outcome-based Development Impact Bond (DIB) for poverty alleviation in Sub-Saharan Africa, turns charity into venture philanthropy by raising debt funds (not grants) that will be repaid in 3.5 years, with a financial return on investment based on whether they hit their poverty-alleviation benchmarks. Trained over 169,000 new business owners. Impacted the lives of nearly 940,000 individuals. Currently, they work in Kenya and Uganda but hope to achieve greater scale by replicating their Graduation program across Africa. 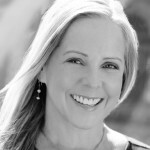 Over 80% of their business owners are women, whom studies show invest 90% of their income back into their families (compared to the 35% men invest), prioritizing healthcare, nutritious food. and education. Because we’ve known the thoughtful, smart leaders at Village Enterprise Fund for many years–as well as the rigorous methodology of their independent, third-party randomized control trial (RCT) impact evaluator, Innovations for Poverty Action, we felt confident to join the first round in a new debt fund through Impact Assets that will allow Village Enterprise to scale small businesses across the continent. 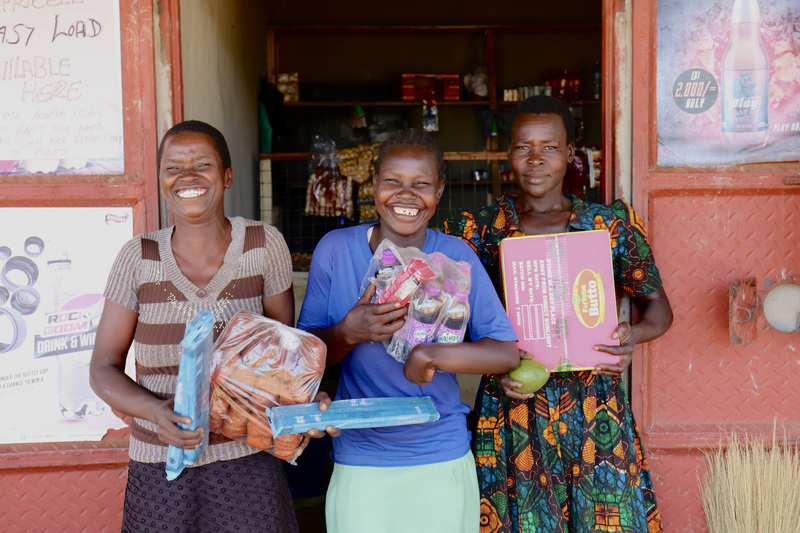 Village Enterprise provides training and community for the poorest workers who don’t want a handout; they want to apply their skills and creativity to earning a dignified income. Transformed the lives of 90,540 children, women, and men by starting 4,527 new businesses and training 13,581 entrepreneurs in Kenya and Uganda—over 1,000 more businesses than last year. 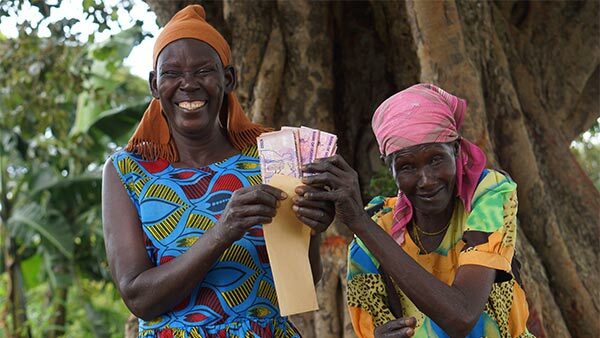 On track for year one of Africa’s first Development Impact Bond for poverty alleviation to reach nearly 14,000 new households through a pioneering results-based financing tool that ties funding to verifiable results. New DIB brings in big donors, provides biggest test of model to date. RCT shows that our Graduation program is a cost-effective, scalable, and sustainable solution to increase incomes and savings of the very poor according to Innovations for Poverty Action. Ultra-poor graduation model shows that more than just cash is needed. Adapted and delivered our program for South Sudanese refugees and out-of-school youth in Uganda through new partnerships with Mercy Corps that target these vulnerable and rapidly growing populations. Launched first-of-its kind partnership to reduce poverty and conserve Bonobos in the Democratic Republic of Congo with African Wildlife Foundation on the first Village Enterprise Extend partnership. Endorsed by Founders Pledge as a top charity for women’s empowerment. Founders Pledge is a charity through which company founders and investors commit to donating a percentage of their personal proceeds to a charity of their choice following a successful exit. Launched businesses that promote harmony with wild animals, particularly elephants around Uganda’s Murchison Falls National Park, aiming at reducing poaching with a grant from the Illegal Wildlife Challenge Fund (IWT). Embedded Human Centered Design (HCD) as our organization-wide approach to innovations. HCD, developed by IDEO, provides a structure through which our new ideas can grow out of the lived experiences and challenges of our end users. Prototyped mobile money pilot in Kenya to deliver seed capital funding through M-Pesa, Kenya’s world-renowned mobile money platform, and piloted tablet technology with field staff to improve program delivery and monitoring. Photographs and video courtesy of Village Enterprise Fund. 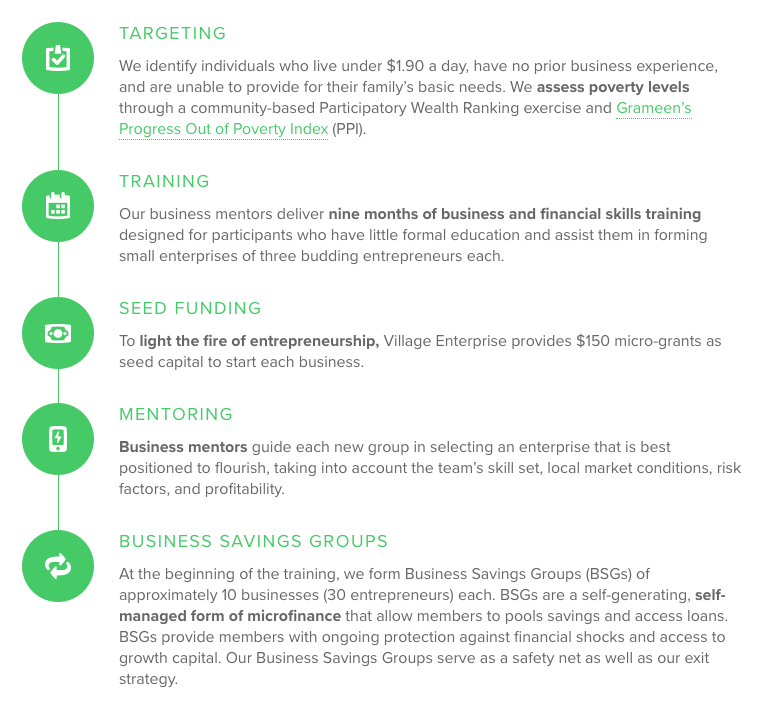 LEARN more about the the programs and investment fund of Village Enterprise here. DONATE directly to help support Village Enterprise, here.